Info "Hit the targets to knock 'em down! You've got unlimited ammo, so fire away!" Shoot the Breeze is one of Ashley's Microgames in WarioWare: Smooth Moves. The title comes from the expression "shoot the breeze," which means a casual chat. The minigame Can Shooter is an extended version of this. The player must shoot the objects on the screen. The player has unlimited ammo to complete the game. When time runs out, the player loses the game. 1st level difficulty: There will be two cans. 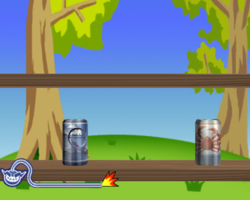 2nd level difficulty: There will be three cans, or a moving mechanical mouse. 3rd level difficulty: There will be a robot that must be shot four times. This page was last edited on November 17, 2018, at 15:41.